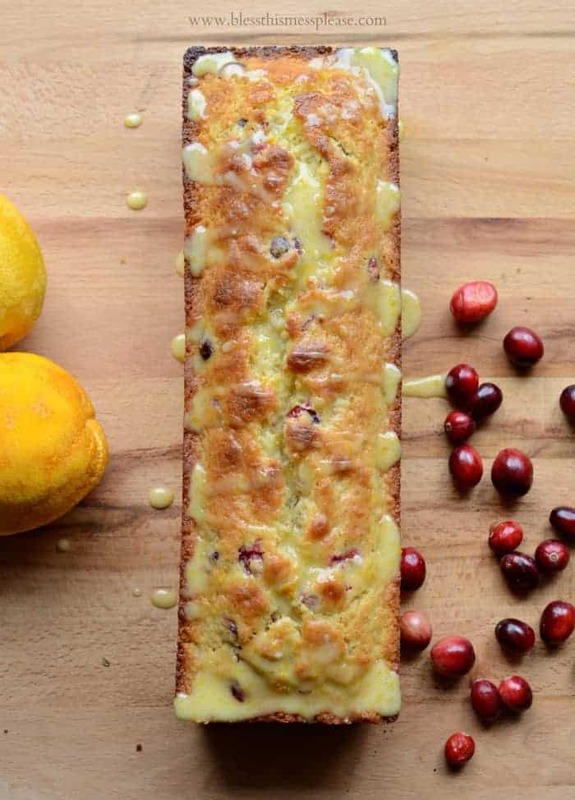 Cranberry Orange Bread is sweet, gorgeous, and perfect for giving! Made with lots of orange zest, melted butter, and fresh cranberries. This is one of my all-time favorite holiday treats. I make batches and batches of it to put on my friend and neighbor goodie plates, take to parties, have for dessert when friends come over for mom dates, and every other excuse I can think of. A few weeks ago, I picked up my first bag of fresh cranberries and I had just enough to make a double batch of this bread after making the other recipe I had planned for them (I did a cranberry orange pork roast that was fabulous! The recipe is in my Freezer to Slow Cooker ebook). It was so exciting to be making this recipe because not only is it really really good, but it reminds me of Christmas and the holiday season and giving. I may or may not have been jamming to my Christmas station on Pandora while baking, too. I’m planning on having an intentional Christmas this year. Doing things because they mean something and because I want to and not just because I should or can. I know it might be crazy, but I just love making dozens of goodie plates for neighbors every year and that is for sure on my list for this season. This bread has made the list to go on them again, too! That’s saying something! I have made this recipe as traditional loaves, tea loaves (which are pictured), muffins, and mini loaves as well. It always turns out well and it always gets rave reviews. 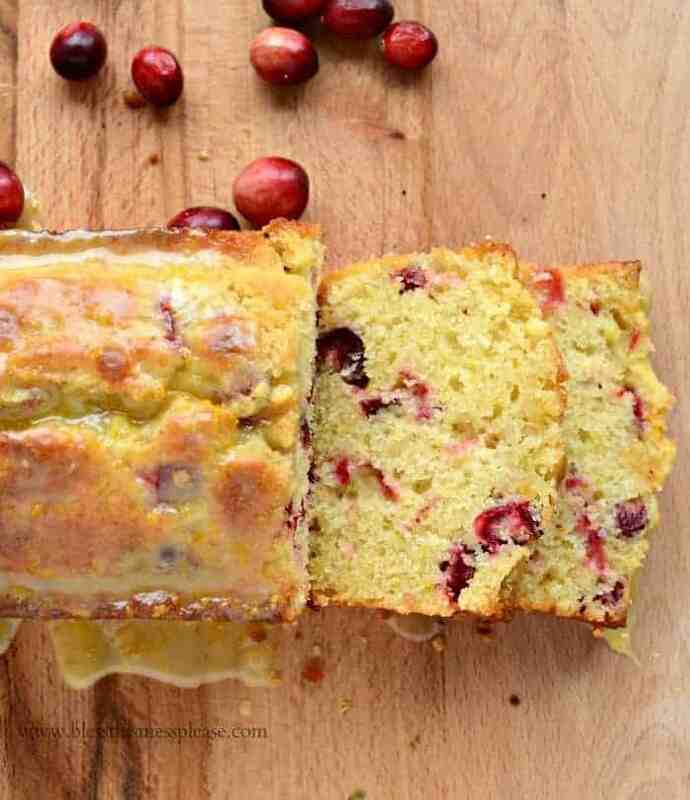 There’s something magical about those bright little pops of tart cranberry mixed in with all that sweet bread. Adding a little orange glaze to the mix really puts this bread over the top. You will love it! Bake in a tea loaf pan at 350 degree F for around 50 minutes. Bake 12 muffins in a standard size muffin tin at 350 degrees F for 18-20 minutes. Bake mini loaf pans at 350 degrees F for 30-35 minutes (depending on the size of your pan). Isn’t it pretty? I got the tea loaf pan from King Arthur Flour last year for Christmas and I just love it. I do not like things that are battery or raw when they are supposed to be cooked (like undercooked pizza dough and quick breads; cookie dough is very much ok though). The tea loaf pan really helps to ensure a properly cooked quick bread and you bake it for less time, too, which is nice. No matter what you choose to bake this recipe in, adjust your cooking time as needed; it’s good all the ways. Plan on buying a few extra cranberries for your cranberry sauce recipe. When they are hanging out in the fridge after Thanksgiving, you’ll be obligated to make this bread. Mixing the orange zest with the sugar before you add anything is the secret of this bread. The sugar pulls the oils out of the zest and you are making orange infused sugar which really makes the orange flavor carry throughout the bread. Best trick ever! Feel free to double this recipe; it works great. Preheat the oven to 350 degrees and grease a 9×5 bread pan or a tea loaf pan well. In a large bowl, add the granulated sugar and the orange zest. Stir the mixture together until the sugar starts to turn a bit orange and is fragrant. Add the flour, salt, and baking powder to the sugar mixture and whisk to combine well. In a separate bowl add the buttermilk, butter, eggs, orange juice, and vanilla extract. Whisk to combine well. Add the wet ingredients to the dry ingredients and stir until just combined. Fold in the cranberries and then place the batter into the prepared pan. Bake until a toothpick inserted into the center comes out clean about 1 hour and 10 minutes for a traditional bread loaf pan (and about 50 minutes for the tea loaf pictured). If the top starts to brown too quickly, you might want to cover the bread with foil for the last 10 or so minutes of baking. Remove the bread from the oven and allow it to cool on a wire rack for 20-30 minutes before removing the bread from the pan. Run a knife along the edges of the pan before you turn it upside down to remove it from the pan. Whisk together the ingredients for the glaze until smooth. Drizzle the glaze over the warm bread and then slice to serve. This recipe doubles well if you want to make 2 loaves. This recipe is adapted from and inspired by Two Peas and Their Pod. 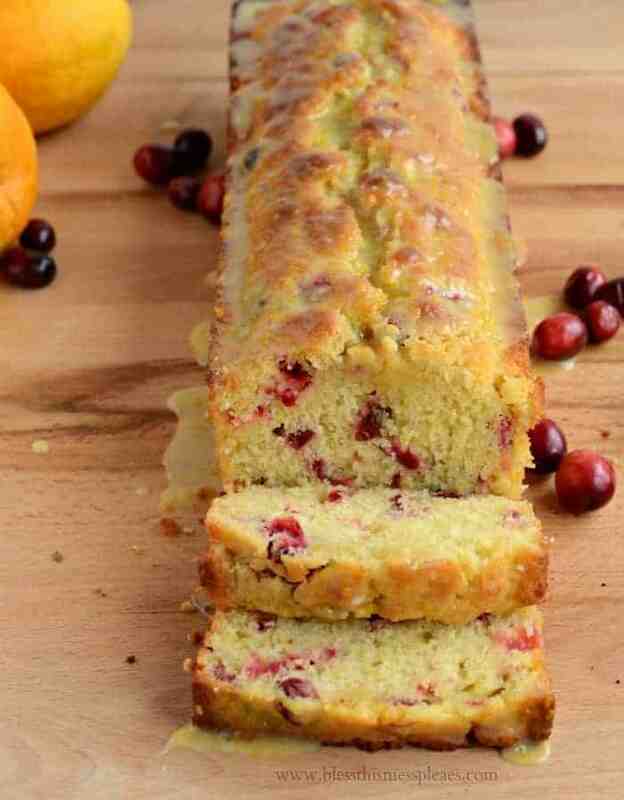 I’m totally wishing I had some of this Cranberry Orange Bread in the house still, but it sure didn’t last long. I can’t wait to make another loaf. Every time I make this and give it as gifts, I’ll have multiple people ask me for the recipe. It’s just so good. Enjoy from my kitchen to yours! I can’t get this made fast enough! It looks delicious and perfect for giving as gifts in mini-loaf size too. I will have to find a tea loaf pan now, what a great idea. Thanks for another yummy recipe! I doubled the recipe & made two loaves. I froze one & served it today in my Sunday school class. They raved about it. I have plans to make mini muffins & small loaves next week. Woohoo! SO glad you loved it as much as we do. I’m making a double batch today too! One for dessert with family comes over for dinner and one for later. I like to preslice it before I stick it in the freezer so I have just pull it out and let it thaw and it’s ready! This looks delicious. I am going to try to substitute canola oil for the butter to save on the saturated fat. I think it probably will work ok in this recipe, thanks. oh yum, this looks super delicious! thank you! and don’t worry, you’re not the only one who may or may not be turning on the Christmas Pandora 🙂 love this time of year! Thank you for this! You have inspired me to make something for our neighbors. I’ve been subtly trying to reach out to the more shy neighbors and I’m hoping making this will help. This is a great place to start 🙂 It’s really fun to see people’s reactions to unexpected gifts too, I think you will love it! Hi I am making this bread and the recipe calls for baking powder but on the video it uses baking soda, what did you use? Use what the recipes calls for, I have a friend edit the videos and they aren’t as accurate. Sorry for the confusion, I’ll be sure to update the video! This does not look like a 9×5 pan. What size did you use? Did it take more of the recipe because it looks a lot bigger? It’s a tea loaf pan which I love. I have made it many times in a traditional bread pan and the cooking times for both pans are indicated in the recipe! Enjoy! Hi! Excitedly trying this out today! However (newbie alert) I didn’t know how to chop cranberries… so I did it by hand with a knife. Apparently, you can use a food processor. But, none the less, I am excited for this bread! I made this last Saturday, it was awesome, i will be giving it as gifts this year. i doubled the recipi, i used one 9×5 loaf pan, and two mini loaf pans. Hooray! Thank you for letting me know you liked it! I’m making another batch this weekend too! Oh….wow….yummy stuff! I baked 4 mini loaf pans for 46 minutes, drooling the whole time. If I ate 3/4 of 1 mini loaf in one sitting……that is roughly 2 slices from a big pan right?!? The bowl, beater and spatula were equally delicious! I only chopped half the cranberries, the other half was left whole. Next round, I will chop all the berries; the blend of orange and chopped is a better taste ratio on my tongue. Thanks for sharing!! Good Golly! I finally got around to making this last night and it is so delicious! I don’t know if I’m going to be able to give away the second loaf I made, the first is already gone! Thank you!!! LOL! I normally make a huge huge batch and we eat most of it. That stuff is so good isn’t it! I’m so glad you liked it! I am addicted…. third batch…. hope I have enough cranberries in the freezer to get me thru the year! What are the size dimensions on your tea loaf pan? I’ve had my eye on one that’s 12×4, does that sound about right or are they closer to 16 inches? 12″ x 4″ x 2½” tea loaf pan holds the equivalent of a 9″ x 5″ loaf pan. This is the one that I got from King Arthur Flour 🙂 http://www.kingarthurflour.com/shop/items/tea-loaf-pan I love it and the little pieces are perfect for kids! Did the GF flour work? What brand did you use?! I’m so glad you tried it with GF flour, I think that will be useful to other people so thank you. It’s in the oven right now and my house smells SO good! This is my favorite combo for a gift bread, so glad I found your recipe as it looks better than my old standby…from the Ocean Spray package. How did it turn out Peggi?! I just made this recipe last night and it’s simply delicious. My only problem is that every time I make cranberry bread the berries float to the top. What is the trick to get them to bake throughout the bread? You could give them a quick toss in a tablespoon of flour before adding them to the bread, that generally solves sinking and floating issues! This was the most disappointing recipe I have tried! WAY too much butter!! This recipe was more like a fried dough rather than bread. It was great, in fact I made it for Christmas and I had extra cranberries and I’m making another loaf. it’s my 2nd time baking this and omggg… I AM IN LOVEEEE.. Thank you soo much for this yumilicious recipe!! I bought a extra long loaf pan, but I don’t know how to adjust the oven temperature and cooking time. Can you help me with that? Oven temp will be the same and just take 15% off of the baking time (pretty standard for any recipes using that pan), so if it’s an hour bake time, it should be done around 45 minutes. Does that help? Holler if you need some more information! I decided to bake muffins instead of bread because knowing me, I’d eat half the loaf before anyone else got to it. This recipes perfectly makes enough batter for 12 regular muffins, which I baked at 350 for 18 minutes. I added walnuts for an extra crunch and they came out amazing! The smell is absolutely Devine. Thank you for sharing that! I’m guilty of eating way too much of it too (and just bought oranges for my first batch of the year!) so I’m certainly going to try it as muffins. Thank you for the feedback! This makes an excellent gift and people will be knocking on your door to get the recipe too. Thanks for sharing the love! Is it okay to use frozen cranberries? Yes, I have with great success before though they are harder to chop! I’m making it today too to take to neighbors! Such a loved treat, I’m glad you liked it too! My daughter and I made your recipe today for our Christmas baking day. And it was SO good. Thanks for sharing! Happy Christmas Baking to you friends! I hope it’s a regular this time of year for years to come! I am going to make Cranberry loves following your recipe. It sounds sooooo good. I do have a question? I just sent my husband out to go buy me the 4 mini loaf pans. Do I just need to double the recipe to fill those pans? Do I fill each loaf pan to the top? Thanks sooooo much. Mini loaves still vary a little and I bet you could get 4 loaves out of 1 batch. You’ll want to fill them about 2/3’s of the way full too, if you fill to the top it’ll overflow and make a mess in your oven. If you find that you have too much batter, just add it to a muffin tin and bake as to not waste any since I’m not sure on the size of your mini tins! Hope it works great, can’t wait to hear how you like it! Hi! Any idea how long these keep? I plan on making ahead of time and giving out as gifts but want them to taste fresh! I give them as gifts a lot. I’d pop them in the fridge, uncut for up to three days (cooled and wrapped up well in plastic warp) and then slice and serve and if it’s going to be more than 3 days I stick it in the freezer, uncut, then thaw overnight before cutting and serving. Works great! 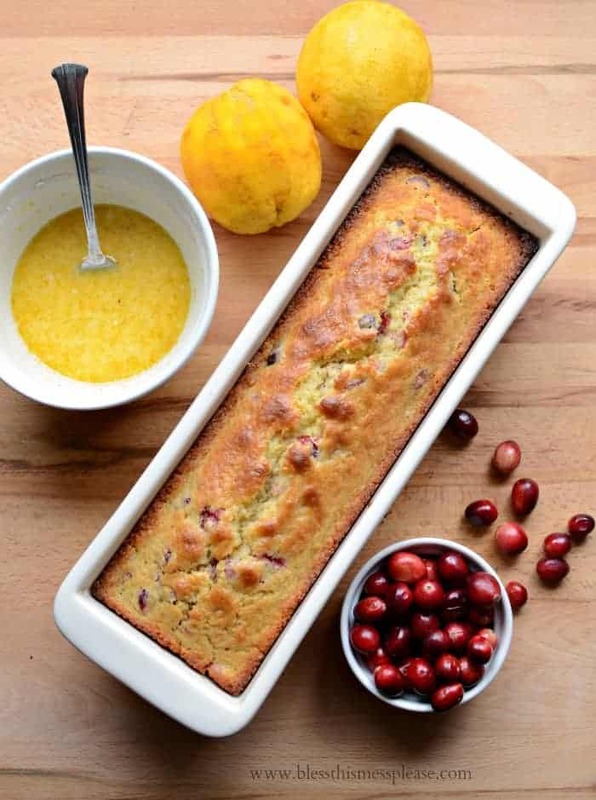 This Cranberry Orange Bread has a wonderful taste as a pudding. I made this bread, followed the directions exactly, yet the bread came out wet like a pudding. Do you have any suggest as to why this happened? I even purchased new baking powder. My goal is to have Cranberry Orange Bread and NOT Cranberry Orange pudding. Sent you an email! I bet there was just a mismeasurment or maybe you under-baked! Hopefully we can figure it out because it’s awesome as a bread! I made this bread today and it was absolutely delicious! I like it with or without the glaze. Such a great find! I’m going to hold on to this recipe! So glad you like it as much as we do and I’ll make it often without the glaze too, still delicious and plenty sweet for sure! Glad to find this recipe! I was going to try it today, but I only have clementines on hand. Will those work for the zest and juice? You know, I don’t know… I’d love to hear what you think if you try it! This bread it so delicious and easy to make. Directions were perfect! I’m going to make 2 batches tomorrow. One tea loaf gor my famy and 4 mini liaves to gift. Thank you so much a d Merry Christmas! I should have proofread my previous comment! Hoping you can make out what I attempted to write. 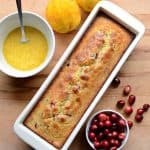 can I substitue and use cranberry orange relish in this recipe if so how ? I can not find fresh cranberry’s in any local stores at this time can dries cranberries with no added sugar be used ? If yes what would the measurement be for the dried cranberries? Sometimes mine will have “fresh berries” that are in the frozen section! That’s your next best option. I’m sure dried would work, you might want to play around with chopping them up and what amounts. 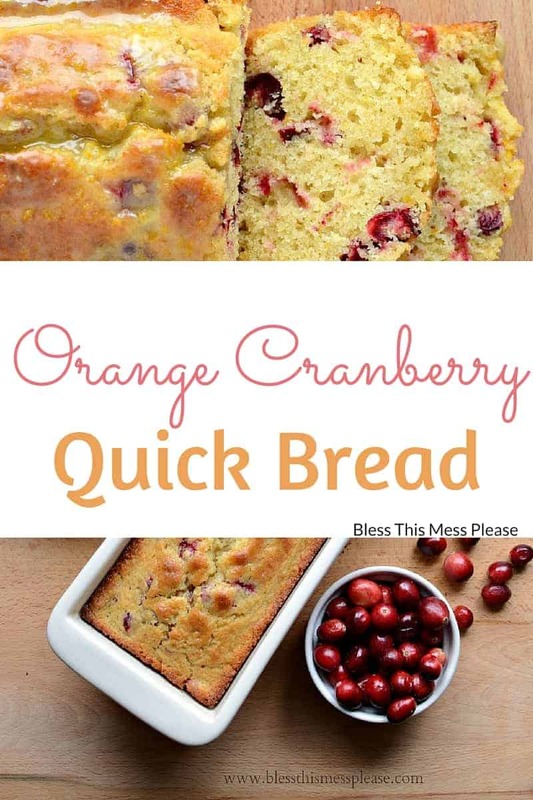 I just made this today and I have to say that this was the best Orange Cranberry Bread I have ever had, and I have had a lot! An FYI, since dried cranberries was all that I had on hand, that’s what I used and it worked out perfect (I didn’t really measure, I just grabbed two handfuls out of the bag), but I do plan on making it again with fresh, to compare. Yay! I’m so glad that you came back to tell us that the dried cranberries worked! Thank you for that. And you will have to try it with the fresh! They are so tart and delicious, it’ll be a whole different bread for you! Sorry…dried cranberries “were” all I hand on hand…not “was”.